The Decontamination & Sterlisation (CSSD) conference will take place from the 28-30 May 2019 at the Gallagher Convention Centre, Johannesburg, South Africa. COHSASA accreditation award means the healthcare organisations have entered a rigorous quality improvement programme and have been assessed against, and comply with, standards recognised by the International Society for Quality in Health Care (ISQua), the global body overseeing accreditation and quality improvement programmes in healthcare organisations in 70 countries around the world. COHSASA itself is accredited by ISQua as are its standards. The Council for Health Service Accreditation of Southern Africa NPC (COHSASA), has achieved its fifth accreditation from the International Society for Quality in Health Care (ISQua), the global authority with a mission is to improve the quality and safety of healthcare worldwide. This fifth accreditation, valid from 2018 to 2022, means that COHSASA itself, as an organisation, has been independently assessed by the most credible authority in the world in this field and has had its existing systems and operations validated. The process does not end there as the aim is to drive continuous quality improvement throughout the organisation. COHSASA is the only health services accreditation body in sub-Saharan Africa to be accredited by this ISQua. COHSASA has achieved accreditation from ISQua in 2002, 2006, 2010, 2014 and now in 2018. 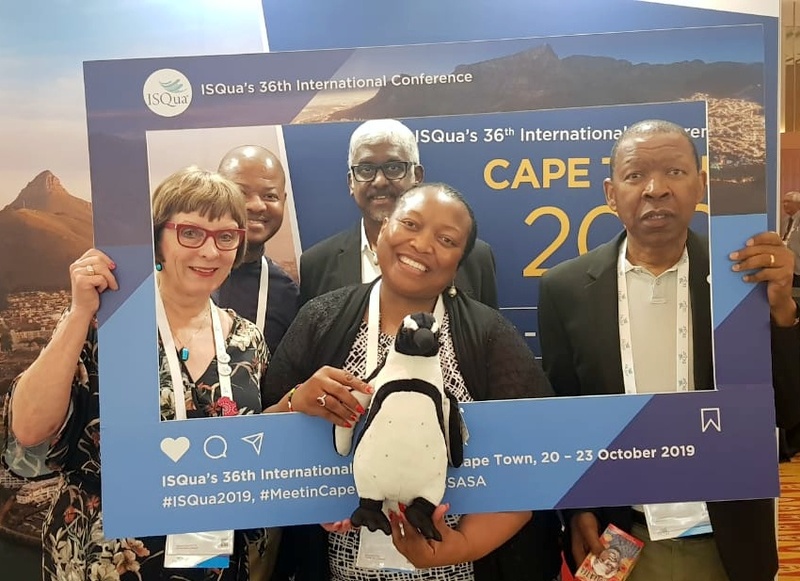 This latest accreditation further focuses attention on this not-for-profit organisation that will be co- hosting ISQua’s 36 th International conference in Cape Town, the first time that the conference will be held on African shores. Furthermore, the COHSASA Healthcare Facility Standards (First Edition) has also achieved ISQua accreditation for the period of 2018 to 2022. The ISQua surveyors gave the COHSASA Healthcare Facility Standards a rating of 89% and described the result as “excellent”. This was the first survey of this suite of standards which includes: Generic Service Elements, Inpatient Care standards and Ambulatory Care standards. These standards are an amalgamation of six existing sets and they have been combined to provide consistency and reduced duplication. Based in Cape Town, the Council was founded in 1995. In the past 23 years, it has worked with 594 healthcare institutions across 35 clients in 11 countries in Africa. Using professional standards, COHSASA identifies gaps in service provision and assists healthcare staff to meet those gaps. The Council empowers health workers to ensure that there are systems and processes in place, underpinned by professional standards, so that patients are provided with safe, quality care. “I am absolutely delighted that COHSASA has been accredited by the International Society for Quality in Health Care (ISQua) for a fifth time and has achieved accreditation for twenty consecutive years. This accreditation is an indication of excellent team work within the organisation, high quality systems, a commitment to our mission, vision and values and most important, a commitment to our clients. “I am pleased that our healthcare facility standards have also been accredited for four years. We now have just two sets of standards, healthcare facility standards for inpatient care and ambulatory care. These two flexible sets enable us to better respond to requests to accredit facilities delivering new approaches and models of health care. We are committed to maintaining high quality programmes and services for all our clients for many more years”. Above left: Elom Hillary Otchi, Technical Director of the Africa Institute of Healthcare Quality Safety & Accreditation (AfIHQSA) helped drum the next ISQua conference into being. He is photographed with the CEO of COHSASA, Jacqui Stewart, in resplendent Xhosa traditional wear. Above right: Lerisha Mudaliar of the Cape Town Convention Bureau talks to potential delegates at the #Cape Town2019 stand in Kuala Lumpur. Kuala Lumpur – a sprawling 243 sq. km urban landscape – is an exciting, first world city but caught in a time warp of architecture. Modern skyscrapers border on Moorish edifices that border on British colonial buildings. The locals are polite and helpful, and they are wonderful hosts. The food is sensational, the city sprawl overwhelming. The world-famous Petronas Twin Towers. The conference was based at the impressive Kuala Lumpur Convention Centre – a massive edifice which straddles one of the more impressive parks in KL. The dramatic atmosphere in the park (particularly during a thunderstorm) is emphasised because the north end of the park is dominated by one of the highest buildings in the world, the Petronas Twin Towers. Delegates were seen popping into the Suria Shopping Centre at the base of the towers – seven floors of high-end consumer luxury to cater for shopaholics. The more adventurous explored the Batu Caves, where a Hindu temple nestles in limestone. A wide variety of conference sessions were well attended – either plenary or in smaller conference venues – to learn and share knowledge about the latest theoretical and practical developments in the field of quality improvement, patient safety and external evaluation. ISQua, which represents 70 countries over six continents, is acknowledged as the global authority that for the past three decades has dedicated itself to promoting quality improvement in health care. It does this through education, knowledge sharing (the conference being one of the principle vehicles for this), evaluating accreditation bodies and connecting like-minded people through its healthcare networks. It supports health systems worldwide through its extensive networks and continuous work to improve quality in healthcare. The theme of this year’s conference in KL was “Heads, Hearts and Hands ‘Weaving the Fabric of Quality and Safety’” and true to that theme, every delegate was presented with a gift of the most intricate woven lanyard-style necklace at the Welcome Reception. It was at this reception that delegates got their first glimpse of plans for next year’s ISQua conference. This time it will be held in Africa, in Cape Town (#CapeTown2019). To promote it, the Cape Town and Western Cape Convention Bureau hosted a stand for delegates to get a taste of what adventures lie in store. The theme for the 2019 conference is ‘Innovate, Implement, Improve: Beating the Drum for Safety, Quality and Equity’. Many stopped at the stand to trade flyers in their conference bags and business cards for gifts (a clever promotion to create awareness and draw prospective delegates). Some won amazing gifts, like cage diving with Great Whites in False Bay. But the highlight, from a Cape Town perspective, was the handover ceremony, when the baton for organising and hosting the conference passes from one city and country to another. Jacqui Stewart, CEO of COHSASA, was determined that the handover would not be lame and so she whipped up enthusiasm among African delegates attending in KL to dance, beat drums and wear traditional African dress on stage. They marched on confidently – appropriately – to the official FIFA World Cup song for 2010, Shakira’s Waka Waka (This time for Africa). Ms. Stewart also made a short speech, spelling out the reasons for a logical move of the quality improvement focus to shift to the African continent. There was also short documentary on Cape Town and the Western Cape which should have whet the appetite of the most blasé traveler. The ISQua 2018 conference in Kuala Lumpur was a great success, with revolutionary content (the role of technology, the role of compassion, metrics, AI, using logical thought to establish effective process) and great speakers. Once again, ISQua pulled it off. CEO of ISQua, Peter Lachman, and his loyal team at ISQua work so hard each year and the cumulative result is that they have created one of the premier events on the global health calendar. 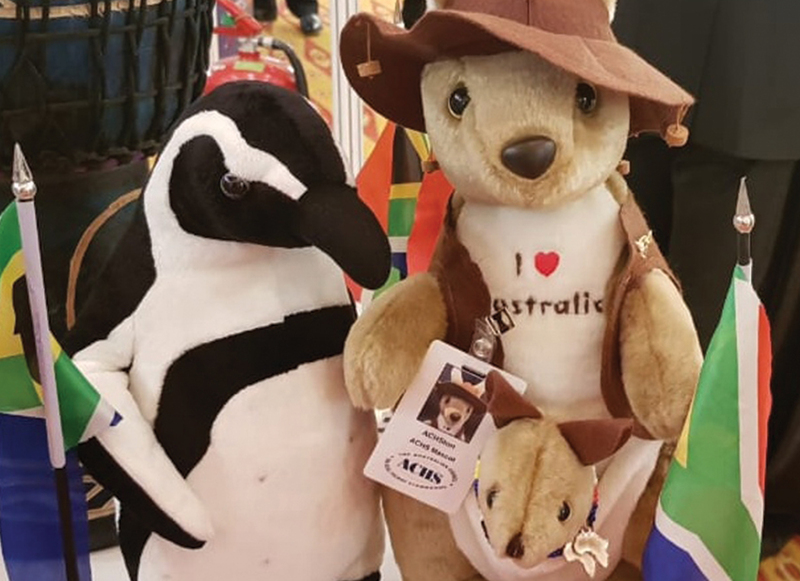 Above: A few members of the African contingent who danced on stage at the beginning of a plenary session in Kuala Lumpur to announce the next ISQua conference in Cape Town in 2019; above left – Pumza the Penguin, the ISQua Cape Town 2019 Mascot, poses with Acshton the Kangaroo, the mascot for the ACHS (The Australian Council On Healthcare Standards). Above right: in the frame for the Cape Town conference next year (from left), Jacqui Stewart, CEO of COHSASA, Mmbangiseni Magoro, Director: Systems Data Analysis and Research at the Office of Health Standards Compliance (OHSC); Professor Morgan Chetty, Chair of the Independent Practitioners Association Foundation, Dr Siphiwe Mndaweni CEO of the OHSC and Dr Vincent Setlhare, Acting Head of Department – Family Medicine at the University of Botswana. 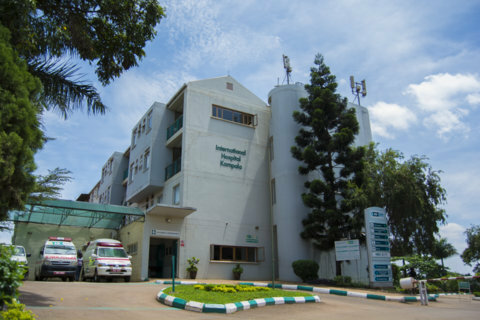 The International Hospital Kampala (IHK), a 100-bed private hospital in Uganda and part of the International Medical Group, has noticed a significant drop in hospital-acquired infections (HAI) and more successful monitoring of continuous quality improvement and adverse events since its second accreditation with COHSASA. This is according to hospital staff who have been working with the accreditation programme since 2014 and with the Council’s Patient Safety Information System (PatSIS) since May 2015.They have been collecting data to back up their claims. IHK is the only COHSASA-accredited hospital in Uganda. The hospital has now been accredited for a second time for three years after achieving a score of 97 out of 100 at its external survey. 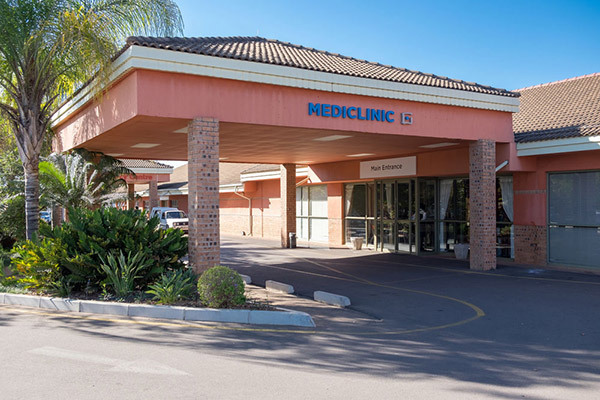 The Council for Health Service Accreditation of Southern Africa (COHSASA) is the only internationally accredited quality improvement and accreditation body for healthcare facilities based in Africa. In the past 23 years over 550 facilities throughout the continent have entered the COHSASA programme to improve the quality and safety of the healthcare services provided to patients. 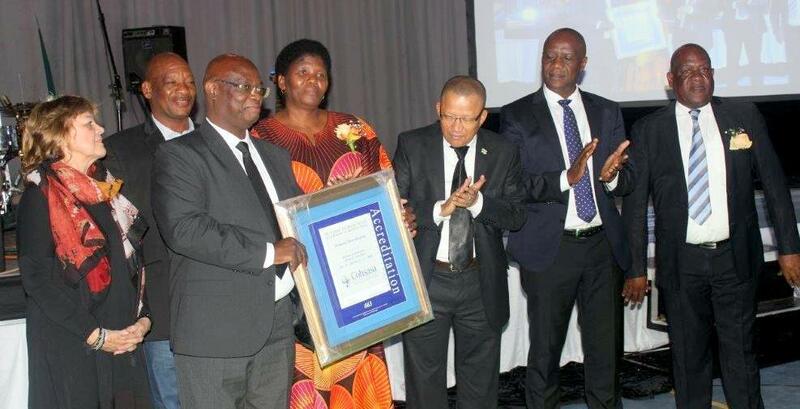 IHK first entered the COHSASA programme in April 2014 and received its first full accreditation award in August 2015 with a score of 86 out of 100. 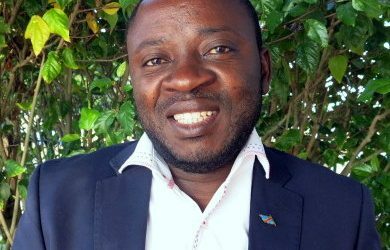 The hospital re-entered into the programme soon afterwards and in November 2017, the COHSASA Board accredited IHK for three years when a score of 97 was achieved. “The International Hospital Kampala (IHK) enrolled in the COHSASA programme in 2014. This decision was taken because COHSASA standards were specific to a healthcare setting. We wanted to know how different departments in a hospital were supposed to be operating to implement the relevant internationally-accepted standards. “As a hospital, we had specific quality problems which included, but were not limited to: documentation, measuring hospital acquired infections, risk identification and mitigation and measuring quality improvement. It was important for us to respond to these issues so that continuity of care and appropriate interventions for the patients could be made. 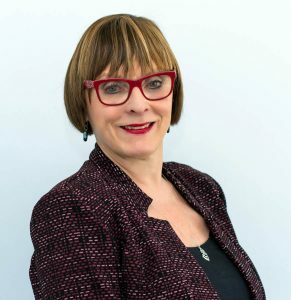 “In addition, the web-based CoQIS quality information programme generated data that could be collected and analysed to inform different quality improvement projects. 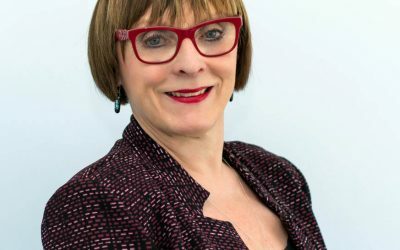 “However, as with any new programme, there were challenges: poor staff buy-in and lack of adequate knowledge to drive the hospital’s QI programme to mention but a few. This meant we had to make concerted efforts to communicate the importance of the quality improvement programme at staff meetings and training staff to equip them with the knowledge they needed to steer the QI programme. We also needed to collar the support from the executive and senior management team. “The Quality improvement and accreditation programme has positively impacted patient care in our unit in various areas. Many measures in relation to infection control have been implemented since 2017. They include hand washing and the use of checklists for both placement and monitoring of indwelling devices. Audits have been done to ensure compliance with these new measures. “Infection control has been a great success because we have been pushing hand washing, where techniques have been mastered and practiced by staff and the patients’ attendants. Through hand washing audits we have been able to monitor compliance among the staff. This has reduced cross infection in our patients and there is a massive reduction in the rates of nosocomial infection. “Similarly, the use of central venous catheter checklists and protocols and monitoring of all other invasive lines have aided greatly in the prevention and reduction of infections. Staff Members of IHK Accident Emergency Department (from left to right): Ms Angwena Charlotte, Dr. Precious Ndomerire, Ms. Immaculate Ndagire, Ms. Dorah Nakamwa, Ms. Peace Kwiocwiny and Ms. Damalie Nalugwa. “COHSASA standard assessment manuals specify what needs to be in place and how it should be done. From a multidisciplinary point of view, the standards have helped our department to receive prompt and efficient services from other essential service areas and departments of the hospital. “When it comes to assessments, the standards have helped the department to do self-assessments to identify gaps and find possible ways of closing them; for example: protocols, guidelines, tools and checklists have been developed to correct the gaps and reduce mistakes. Risk assessment registers have helped to quantify risks and incidences and inform us to what extent protocols are being followed. “The programme has also improved our ability to obtain meaningful data collection and analysis which has set a basis for continuous improvement. Maternity Unit Staff (front row from left): Ms Victoria Nambaziira, Ms Juliet Nagulani, Ms Tedy Nabasajji, Ms Florence Nambakire, Ms Resty Nansubuga, Ms Sophia Namaganda and Mrs Kyeyune Eva Nambugu. (Back row from left): Ms Annet Nakaddu, Ms Ray Clara Rijoo, Ms Betty Sharon Awubire and Medical Officer, Dr Ivan Kabuye. “The COHSASA Patient Safety Information System – PatSIS – has created transparency in the medical-surgical ward and challenges in the unit are being sorted out with ease. For example, because of reporting these near-misses and incidences, the administration has helped fix our nurse-call system and currently they are purchasing new equipment for the unit.